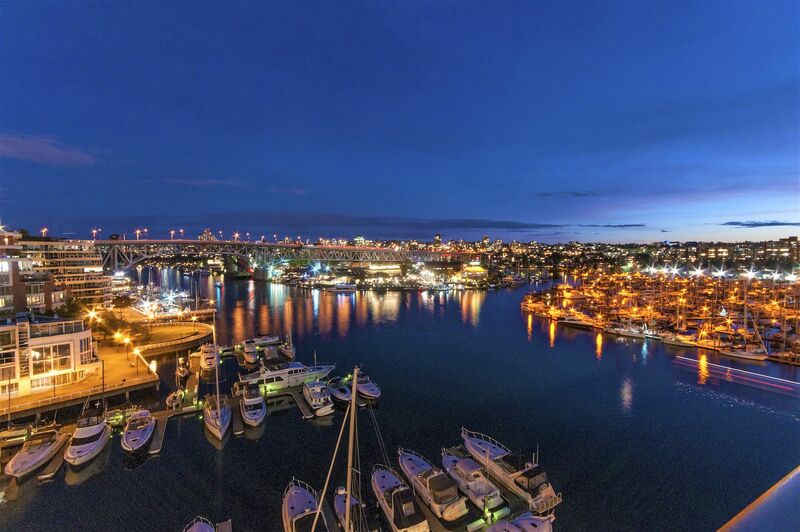 One-of-a-kind, splendid, exclusive WATERFRONT PENTHOUSE on the seawall in False Creek w/ A/C! Quiet. Unobstructed yacht views of water, Granville Island, False Creek Yacht Club, Marina, etc. NEVER been lived in since reno. Southern exposure. Rare house-sized suite w/ oversized rooms & phenomenal space! 2 levels, 3,532 sf bright living space+225 sf rooftop patios. Complete renovation in 2017 w/ luxurious finishing. Open layout & bright, abundant skylight. Chef’s kitchen: Miele appliances, quartz countertops, pantry. Nuheat floors in bathrms. 3 formal HUGE bdrms - each w/ ensuite & water view, ideal for house sized furniture. Massive master suite, directly facing water & spa-like ensuite. 3 parking+1 storage locker. Concierge, indoor swimming pool, hot tub, squash court, gym, steam.